Kentish Council is very pleased to announce the arrival of the “Story of the Sheffield Murals” audio tour. The story begins with why the first mural was commissioned and how a rural town in economic decline was transformed into a thriving outdoor art gallery! Local characters share their vision, tell their stories and fill us in on the history of Sheffield. Interviews with the artists, local identities and the instigators of the mural development are captured on the audio tour. Share the strong and passionate sense of a pioneering rural community working together to save their town. Be entertained as you walk and take home a meaningful personal experience of the Kentish region. The audio tours are excellent and entertaining - 'not to be missed' - as recorded in our visitor’s book at the visitors centre! Cost for a tour is $9 per adult. The audio tours may be purchased at the Kentish Visitor Information Centre at 5 Pioneer Crescent, Sheffield,Tasmania between 9am - 4pm daily. For more information please phone 03 6491 1036. Come and immerse yourself in part of Tasmania's Outdoor Art Gallery at Sheffield. Sheffield's 48 murals depict the history of this panoramic farming region. Murals are spread throughout the town and Mural Walk maps are available from the Kentish Visitor Information Centre in Pioneer Crescent, Sheffield. In addition, the official Mural Book has background on each artwork and can be purchased at the centre. The Overland Track is located in pristine World Heritage Area and has the reputation of being one of the most stunning wilderness walks in the world. Experience the sensation of walking through dolerite mountains and pristine wilderness. View moss-lined waterfalls, expansive lakes and marvel at the abundance of Tasmanian native flora and fauna. This 65 km walk extends from Cradle Mountain to Narcissus Bay on Lake St Clair. The walk takes approximately 5 - 7 days to complete and demands substantial preparation and physical fitness.The best time for walking the Overland Track is between December and March due to the longer daylight hours and warmer temperatures. Weather can change to extreme conditions at any time so walkers must be prepared for cold temperatures and wet weather. For Overland Track bookings, go to www.overlandtrack.com.au. You will find access to the Overland Track Booking System as well as relevant information on Overland Track Fees and National Park Passes. Bookings for the Overland Track open July each year for the coming season. The Tasmanian Trail is a long distance (480 km) multi-prupose recreational trail extending from Devonport on the northern coast to Dover in the south. The Trail is accessible to walkers, mountain bike riders and horse riders. The Trail passes through a variety of spectacular landscapes, farmland, forest and highland plateaus. Moreover, the Tasmanian Trail can be walked in whatever the desired timeframe, by the hour, overnight or day. The Tasmanian Trail guidebook has all the information needed for walkers, horse riders,mountain bikers and can be purchased at the Kentish Visitor Information Centre (03 6491 1036). A steep 8 hour return, overnight, or longer stay walk in a World Heritage Area. There are no facilities of any description and all supplies and camping gear must be carried in. There is only one track into the walls but once in the area there are more walks and mountain climbs available. Access to the car park is on a gravel road from the C171 off the C138. Note: do not leave valuables in the car. Milestones along the way include Trapper's Hut (2 hour return 2 km & 370m H.G); Solomon's Jewels (4 hour return 3 km & 520m H.G. ); Herod's Gate, Lake Salome (7 hour return 6 km & 570m H.G. ); Damascus Gate (9 hour return 8 km & 650m H.G.) and other walks will require an overnight stay. Cradle Mountain National Park has a variety of full day walks that can be enjoyed in the alpine high country. 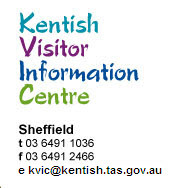 Just contact the Kentish Visitor Information Centre (ph. 03 6491 1036) or Cradle Mountain Visitor Centre (ph. 6492 1133) for more information. Walheim Cabins bushwalker accommodation can be booked on www.sheffieldcradleinfo.com.au or call the Kentish Visitor Information Centre 03 6491 1036. Mount Roland stands at 1233 metres above sea level and provides a stunning backdrop to the Kentish Municipality. 7461 hectares surrounding the range is within Mt Roland Regional Reserve and Mt Roland Conservation Area. The walk takes in the plains and plateau leading to the summit of the peak. There are two tracks to the summit. The first track, the Mt Roland via Kings Road (Face Track), starts from Kings Road, Claude Road Village off the C136. The track turns into a steep mountain climb. This track is not recommended as it is potentially dangerous, steep and awkward. Walking time takes from three to five hours return. The second walking track starts at Gowrie Park Village on O'Neill's Road off the C136. Walking time takes from four to six hours return. This is the easiest track to walk to the summit as it has a moderate incline. From Gowrie Park Village, travel towards Sheffield. Make a right turn into O'Neill's Road and drive for approximately one kilometre to the carpark. The walk follows a vehicle track for a few kilometres. You will pass a couple of waterfalls and creeks. After 45-60 minutes you will come to a log bridge that crosses O'Neill's Creek. The trail becomes a narrow track and starts to steepen. The track continues for a further 30 minutes in order to reach the saddle at 900m elevation. A left turn is then necessary to head towards the summit of Mt Roland. The track rises gently across the plateau and the summit is approximately an hour away. The trig point at the top of the summit provides spectacular 360 degree views to Bass Strait, Cradle Mountain and Barn Bluff. A moderate 2 hour circle walk around Dove Lake in Cradle Mountain National Park. Walkers must register their walk with Parks and Wildlife. Catch the shuttle bus to the lake from the Cradle Mountain Cafe & Information Centre or from the Cradle Mountain Visitor Information Centre. Easy board walks accessed from the Cradle Mountain Visitor Centre. Disabled friendly. O'Neill's Creek Nature Trail is an easy 15 minute walk (approximately 700 metres to O'Neill's Road) and leads to the start of the Mt Roland Regional Reserve walking tracks. You can access the trail from the C136 at the O'Neill's Creek Picnic Reserve. Spectacular Mt. Roland forms the backdrop to the Mt. Roland Regional Reserve east of O'Neill's Creek Picnic Reserve. You will find White Gum eucalypts, Blackwood trees, Browntop Stringybarks, Myrtle trees, Sassafras trees, tree ferns and Dogwood trees. A 90 minute return walk with medium to steep gradients and excellent views of Kentish, Mt Roland, Cradle Mountain and Bass Strait. Access is via High Street, Sheffield until it turns into Nook Road. An easy 1 hour walk through pine and beech plantation forest. Access off the B14. Dooleys Track was originally surveyed by James Dooley in the 1850's to provide a supply route for packhorses servicing miners along the river to Gad Hill. A loop track has now been created to allow for a return journey with low water crossings marked along the route. Dooleys Track leaves Alma Reserve along Jamiesons Road. Please note:Access to State Forest is via the Crown Road Reserve, which passes through private land. Please ensure that the privacy of landholders is respected and keep to the walking track as marked. Dogs are welcome but must be kept on a leash whilst passing through private property. No littering or lighting of fires please. Syke's Sanctuary is 40 acres of reserve with walking tracks, flora, fauna and memorials to Norman Syke's erected by Norman’s son. Access is off the B14. A steep 90 minute walk through 1000 year old manfern glades. Access to the walk is from Lake Barrington Rowing Course picnic area. A steep 45 minute short walk accessed from C132. The walk has views to Bass Strait and Cradle Mountain. An easy 30 minute return walk. Access to the walk is from Mersey Hill Road off the B12. A moderate 1/2 return walk. Access on gravel road from C171 off the C138. All of these falls are moderate 1 and 1/2 to 2 hour return walks accessed from Lemonthyme Lodge off the C132. Staff ask that you register your walk with them. A moderate 45 minute walk on the C144. Park vehicle on roadside and climb stile for access. An easy 20 minute walk off the C138/C171.